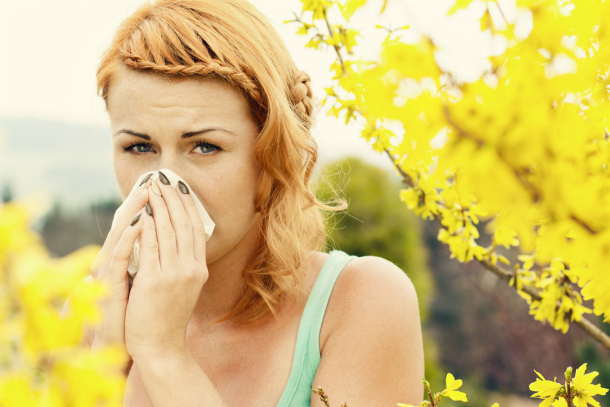 Though we’re really excited for warm weather to return to the Northern Hemisphere, it has come with a serious downside: the return of our seasonal allergies. Itchy, red eyes, a runny nose and a permanently puffy face REALLY mess with our beauty game. What’s a girl to do? She gets expert help, that’s what. We talked to Jamie Greenberg, celebrity makeup artist to stars like Kaley Cuoco, Jordana Brewster and Lucy Hale, for her very best tips on hiding the dreaded Allergy Face. The first giveaway that allergens are in the air? A puffy face. Whether it’s caused by sinus pressure or airborne allergens, Jamie’s favorite way to reduce this is by tackling it at the source. “A cold compress is always good,” she told us. This helps reduce inflammation both internally and externally, and it’s really easy; simply run a cotton washcloth under cool water and drape it over your eyes while you’re lying down. Never put an ice pack (or a bag of frozen vegetables) near your eyes, no matter how sore they are! If you need additional cooling, we recommend a gel mask like Earth Therapeutics Gel Bead Mask ($8), which can be chilled in the fridge and is totally safe (and comfortable!) to use on your delicate eyes. Blessedly, this is incredibly easy: sweep a light coat of shimmer-free bronzer under your cheekbones to hollow them out, and brush a tiny amount over your under-eye area to help conceal any puffiness or dark circles. We love Guerlain Teracotta Bronzing Powders ($53), which come in eight beautiful shades to match every skin tone, and add warmth to your complexion without making you look like a disco ball. We also find that no matter how hard we try, our skin gets a little dry and dull during allergy season. Fortunately, there’s an easy way around it. “Spraying a hydrating beauty elixir with lots of moisture will bring a fullness back to your skin,” says Jamie. “Caudalie’s Beauty Elixir ($49) is a great one!” Because it’s a spray rather than a lotion, you can use it multiple times a day—and as a bonus, it’ll refresh your makeup each time you spritz! More from Daily Makeover: What the Heck Causes Chapped Lips?